Full Description: Toni and Tina: There is a large group of images of this duo listed here, mainly post-WW11 images of the duo prepared as small advert card, though with some post cards. Toni is seen playing 2 miniatures, Tina plays an English concertina, and Toni & Tina together on stage. The main theme (used and adapted on other cards in the series) is this triptych of images of the two of them, though some images feature a band set-up. Other instruments include a xylophone, drums etc. The Images were donated by researcher Mark Davies, who interviewed them in Sheffield in the 1980s. The age of the images can roughly be plotted by Toni’s receding hairline and the appearance of his toupée on later shots! 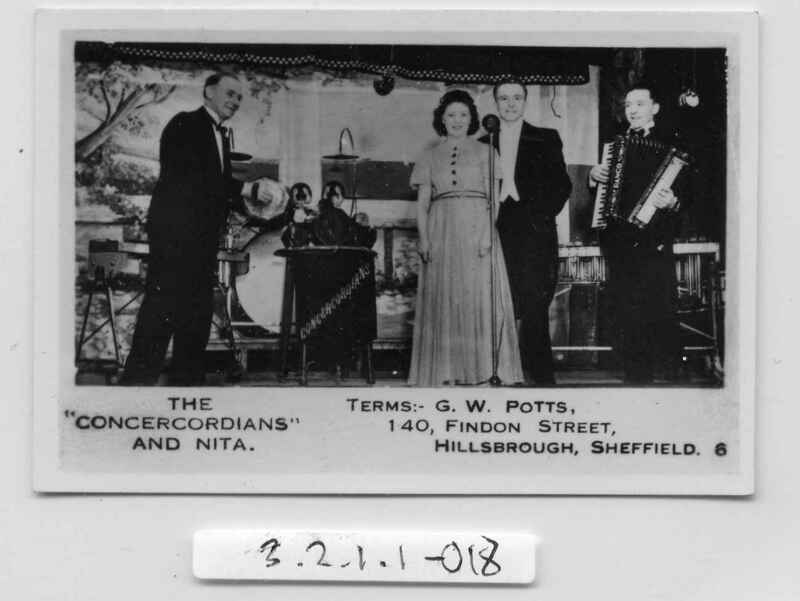 This image is of Toni and Tina as “The Concercordians” – a small business-card sized photo of their band on stage: Toni with large metal-ended Aeola, in front of a table bearing a 5 – 6 concertinas, with a drum-kit, xylophone and accordéon player,. Labelled “The Concercordians” and with address sticker to rear.